as the weather improves my attention turns to salads which are delicious and robust enough to be the focus of a meal or that we can have in the place of rice, pasta or bread, with something such as roasted harissa-smeared chicken thighs. when it comes to salads i have plenty of old favourites but the publication of the new ottolenghi cookery book has been the perfect opportunity to try some new dishes. this radish and broad bean salad with green tahini sauce was perfection itself and will be a regular feature on my table. broad beans are an old favourite and once you decide that the double-podding of the beans is relaxing rather than tedious, it is an absolute dream to pull together. the radishes add a crunchy contrast and the herby tahini dressing is great both on the salad, or with an accompaniment such as lamb cutlets. this dish is part of vegetables, beautiful vegetables, my tribute to national vegetarian week which is currently underway in the uk. first prepare the sauce - you'll need only 200ml, so save any excess for another use. put all the ingredients bar the parsley in a food processor and whizz until smooth. the mix should be creamy; if it's too thick, add water to loosen. add the parsley, blend for a second or two, and check seasoning. put the beans in a pan of boiling water and simmer for a minute or two. drain, refresh in cold water, then remove the skins by gently squeezing with your fingertips. set aside. 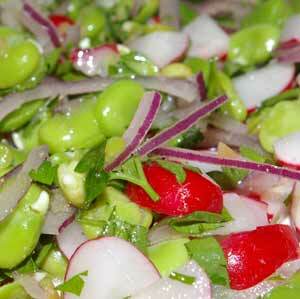 cut each radish into six wedges and mix with the beans, onion, coriander, preserved lemon, lemon juice, parsley, oil and cumin. season. pile a mound of salad in one corner of each plate, pour the tahini sauce into a bowl and stand next to the salad. set a pitta alongside.